On December 27, 2014 during the night quite a nasty snow cover started to come down on a warm earth. At some point the snow stayed, but it stayed wet and icy. This managed to cover part of our solar panels in a thick layer of snow and ice. Since the cover was incomplete, the inverter refused to start and gave repeated errors. We ended the day with 0 Wh of power, a first for our installation. During the night, pieces of ice and snow kept coming down, giving rise to scary cracks and crashes on the roof. December 28 I went to the roof around 13:00 to clean the last bits off with a broom: this was a dangerous operation from below: patches of ice and snow up to 50 kg crashed down on grass and driveway. 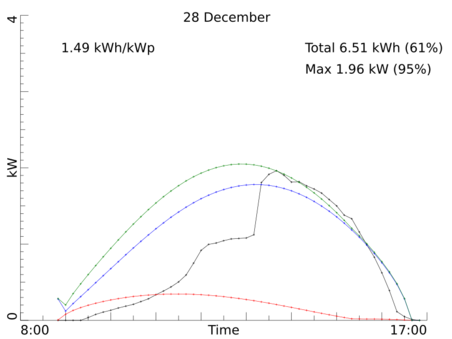 The result of this action is quite apparent in the graph of solar power on that day!